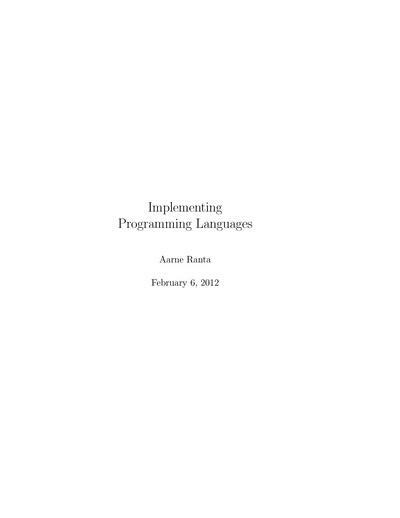 Aarne Ranta wrote:This book aims to make programming language implementation as easy as possible. It will guide you through all the phases of the design and implementation of a compiler or an interpreter. You can learn the material in one or two weeks and then build your own language as a matter of hours or days. Of course, it is not a substitute for the "real" books if you want to do research in compilers, or if you are involved in cutting edge implementations of large programming languages. Things that we have left out include low-level buffering in lexer input, algorithms for building LR parser generators, data flow analysis, register allocation, memory management, and parallelism. Reading hints will be given for material on these topics. In particular, the "Dragon Book"
covers most of these topics. But it does not cover all the things in this book. 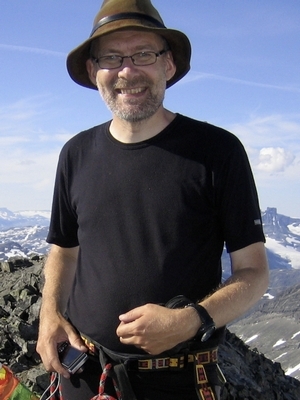 Professor of Computer Science at the University of Gothenburg, Department of Computer Science and Engineering, CEO and founder of Digital Grammars Gothenburg AB, and Principal investigator of REMU Project, Faculty ("Kollegium") co-chair of the Department of Computer Science and Engineering (with Wolfgang Ahrendt), and Coordinator of MOLTO (FP7-ICT-247914) from March 2010 to May 2013. Teaches Databases and Computational Syntax of Natural Language courses.